Half terms by the seaside deserve a little maritime magic, so weigh the anchor and join three shanty-singing fishermen at the Brighton Dome, as they weave a fishy tale of musical merfolk, menacing monsters and… spectacularly bad town planning. With live music, puppetry, a rapping octopus and a stage full of surprises, this enchanting tale from the sea is one for big and little fish alike. At Brighton’s only sewing Social Enterprise, kids can design and make a new outfit for a teddy or stuffed toy this half term. Participants will be able to choose from a huge selection of fabrics and trimmings to make their design, using sewing machines and hand sewing techniques. Perfect for imaginative and practical teddy-lovers with a flair for design. The workshop is £15 to take part; for more information and to book, see here. Brighton Science Festival returns with a jam-packed schedule, including the Pocket Science Funfair, Forensic Theatre, and a full programme of events, workshops and shows for young people that showcase the wonderful world of science. With so many amazing events to choose from, you won’t even realise you’re learning something! Events take place from 16 - 24 February; visit the Brighton Science Festival website for full listings and tickets. 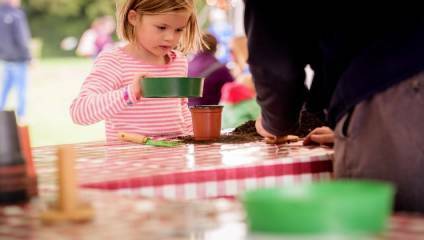 Unearth the secret tools that plants use to grow, and learn more about how we can care for them in this interactive exploration of Wakehurst's grounds. At the end of the trail you'll get to roll up your sleeves and sow your own broad bean to take home. This event is in partnership with the Climate Coalition, the UK's largest group of people dedicated to taking action against climate change. Wakehurst boasts over 500 acres of beautiful ornamental gardens, woodlands and a nature reserve, and it's home to the Millennium Seed Bank – the largest wild seed conservation project in the world.